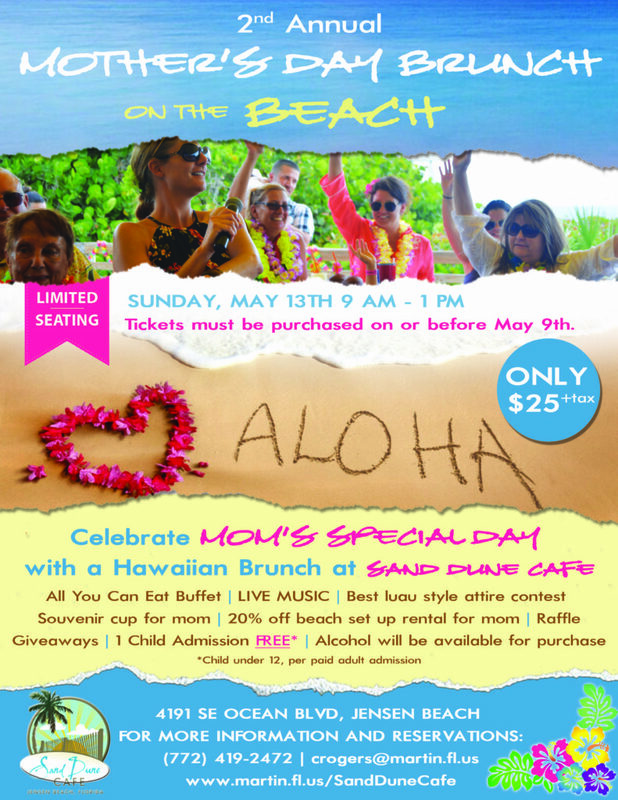 Celebrate Mom’s Special Day with a Hawaiian Brunch at Sand Dune Cafe! All you can eat buffet with live music, raffles, giveaways and more! There will be a best luau style attire contest and moms can receive 20% off beach chair and umbrella rentals! Moms will also receive a special souvenir cup. Tickets are $25 each plus tax. One child admission FREE (under 12, per paid adult admission). Reserved seating only! Tickets must be purchased before May 9 and can be purchased by calling 772-419-2472 or emailing Chekena Rogers at crogers@martin.fl.us. The brunch offers scrambled eggs, french toast and pancakes, home fries, fresh fruit, assorted pastries, muffins and breads, ham, bacon, sausage links, coffee, tea, tropical juices and assorted non-alcoholic drinks, among other things! !